Heart-nosed bat, Kikavuchini village, TZ. I have been investigating the who, what, and why of singing in the heart-nosed bat, Cardioderma cor in the savanna ecosystem of Tanzania. C. cor is a member of the small family of Megadermatidae, whose members sport a variety of vocal behaviors (including songs) and social behaviors (including territoriality), but detailed studies of these behaviors have been largely lacking. C. cor was noted to sing low frequency songs on what appeared to be exclusive foraging areas. Whether these areas could be properly termed “territories,” the role that singing plays in territoriality, and even what the songs looked like had yet to be assessed. This species could offer an exciting opportunity to look at the relationship between songs and foraging territories- a relationship strongly observed in birds but little recognized in bats. C. cor sings mostly during the long dry season (May-October). 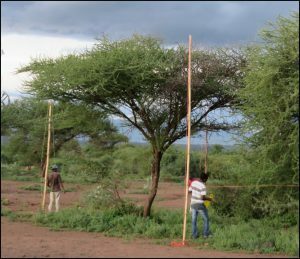 Over the course of 3 field seasons for 17 months total, I trained and worked with a team of young Tanzanians to identify and track singers, study their behaviors and record their vocal repertoire, and conduct playback experiments . We’ve established that singing is a territorial behavior in males. Songs are variable, presenting opportunities to assess the relationship between song metrics and signaler quality and behavior. Every season has presented interesting new behaviors. Some of our work is published (see below), but check back for some of the “meaty” stuff we’re currently working on! Smotherman, M., Knornschild, M., Smarsh, G.C., and Bohn, K.M. 2016. The origins and diversity of bat songs. J. Comp. Phys. A. 10.1007/s00359-016-1105-0. Smarsh, G. C and Smotherman, M. 2015. 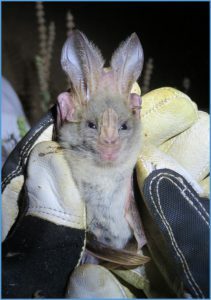 Singing away from home: Songs are used on foraging territories in the African megadermatid bat, Cardioderma cor. Proc. of Meetings on Acoustics. 25: 010002. Smarsh, G. C. and Smotherman, M. 2015. The intra- and interspecific variability of echolocation pulse acoustics in the African megadermatid bats. Acta Chiropt. 17(2): 429–443. The Mexican free-tailed bat, Taderida brasiliensis, is a Molossid that sings complex songs of syntactically arranged phrases including chirps, trills, and buzzes to court females in the roost. This species roosts in large colonies throughout Texas, including Kyle field football stadium at Texas A&M University where they are the main study system of the Smotherman lab. This lab investigates the production of singing and echolocation from the neural level, as well as the behavioral plasticity and diversity of vocalizations in social contexts. I started out grad school investigating vocal learning in this highly social species. 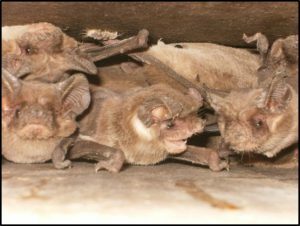 Bats have been shown to be capable of social learning, including vocal learning, in only a handful of studies. I only carried this project so far due to constraints in raising T. brasiliensis in the lab, and then switched to Megadermatid bats after receiving an NSF Graduate Research Fellowship. However, the question of whether bats rely heavily on vocal learning from adults during development still greatly interests me. I worked with Dr. Kirsten Bohn on her project assessing the vocal response of T. brasiliensis to song and echolocation playback. Males sing spontaneously in the roost, and also sing rapidly in response to the echolocation of passerby. Directed songs were shorter and contained more buzz phrases. 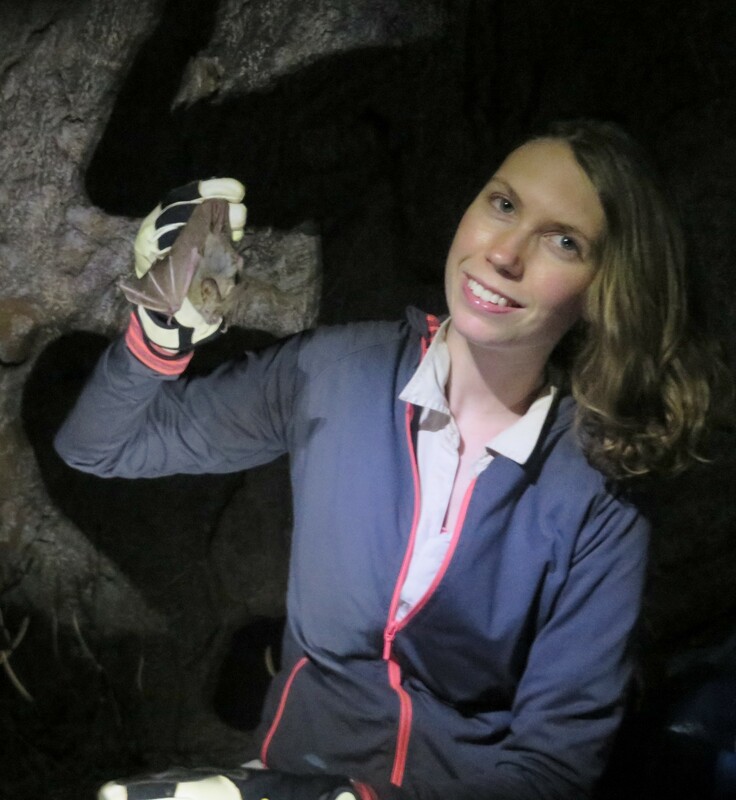 Dr. Bohn has continued to record and study Molossid bat songs in Central and South America. 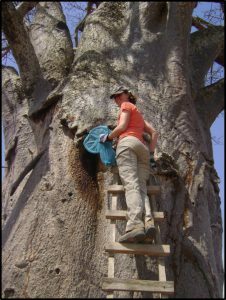 During my first field season in Tanzania in 2012, I stumbled across a seasonlly singing Molossid species that roosts in the crevices of baboab trees. From recordings we found that this species also uses complex songs with large bandwidth, frequency modulated phrases like T. brasiliensis. Bohn, K.M., Smarsh, G.C., and Smotherman, M. 2013. Social context evokes rapid change in bat song syntax. Animal Behaviour. 85: 1485-1491. 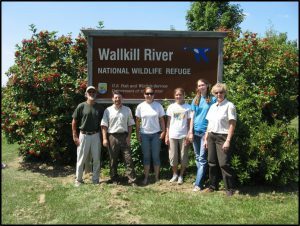 I interned for two summers in 2008 and 2009 at the Wallkill River National Wildlife Refuge in northern New Jersey. I enjoyed the opportunity to be involved in a variety of wildlife management projects, including songbird surveys, endangered bog turtle and songbird habitat management, wetland plant surveys, and river health monitoring. 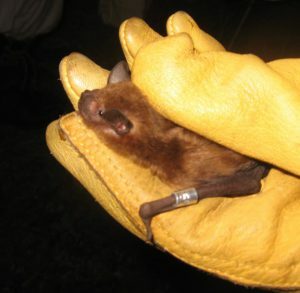 The project I became most involved with across the two summers was the endangered Indiana bat female roosting ecology project of Lindsey Wight, then a masters student at William Paterson University, NJ. Her project was based out of Great Swamp NWR, NJ, but in 2008 she expanded it to Wallkill. the first summer she taught me the ropes of mistnetting, processing bats, tracking, vegetation plots of roosts, and acoustic monitoring using bat detectors. I was very interested in acoustic monitoring and despite the black bears prevalent in the area, I started doing transects at night to find popular foraging sites for when Lindsey and her team returned to net later in the summer. In 2008 we caught the first M. sodalis on the refuge, which was a big event for Wallkill. 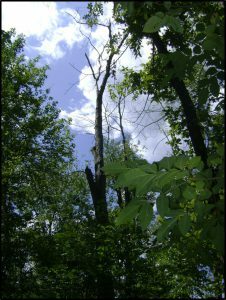 In 2009 the Indiana bat project was a main focus of Wallkill. Unfortunately white-nose syndrome had hit the area for the first time and the refuge experienced a great die-off in bats, especially little brown bats (Myotis lucifigus). I continued acoustic monitoring (including convincing a fellow intern to kayak down the Wallkill River one night so we could monitor the interior of the refuge), and we continued to net, track, and conduct roost vegetation plots. It was a successful summer and we targeted several M. sodalis roosts. While learning many new skills, including GIS applications, I discovered I really enjoyed exploring research questions at all hours of the night.